As far as I am concerned, everybody should love flares. You see, a lens flare is a bridge between the spectator and the film. But not only the film as a film – this story clocking in at one and a half hours or more – but the universe built by the director in which those people, the characters, are transiting. In Paul Thomas Anderson’s Punch-Drunk Love (2002), the thin horizontal flares from the anamorphic lenses are symbolic of the hope and love of Barry Egan (Adam Sandler). In the cinema of Terrence Malick or Sofia Coppola, the flares are almost ubiquitous, always representing the grace of God (or just plain grace). In Martin Scorsese’s masterpiece The Age of Innocence (1993), there is a scene that is replayed two or three times showing the back of Michelle Pfeiffer – who is looking at a lake with glittering points of light sparkling on the screen. In Out of the Past (1947), there is a moment in which, consciously or not, Jacques Tourneur built this bridge. The moment is one of the best things in a film full of great things. 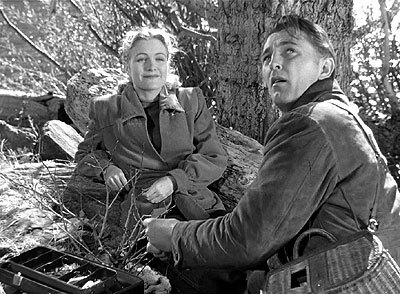 The scene goes like this: Jeff (Robert Mitchum) is with his new love, Ann (Virginia Huston), lying by a lake. The sunshine splashes over the water and the movement of the lake reflects the light in little, glowing points. Yes – just like in the Scorsese. What strikes me most is that this is the one and only moment in the whole film that Tourneur and his cinematographer Nicholas Musuraca break the classic characteristics of film noir – and we are talking about one of the absolute classics of this dark genre – to give us some kind of breath. And this breath, regardless of whether you consciously remember the moment or not, will underline the absolute disgrace that befalls everybody and everything in this rotten world. Tourneur frames the shot with the camera very close to the characters, blocking the lake (Tahoe) and, consequently, its glittering points. But if you have observed attentively, you surely noticed that, although Ann and Jeff said that it was going to rain, clearly, the sun is shining brightly. 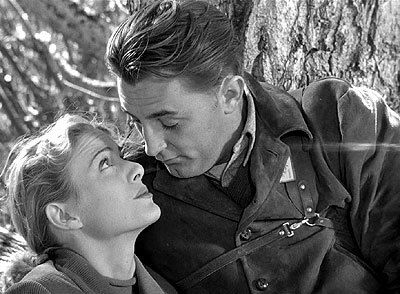 Of course, when Tourneur closes the shot by only showing Jeff’s and Ann’s faces, and illuminates them brightly, he wants us to pay attention only to them. And the reason is obvious: there is no other scene in the whole picture in which we will see these two sharing any happiness. As a matter of fact, from memory, I can count only three scenes featuring Jeff and Ann together – and in one, they are being observed. In all of them – except this one I am discussing – there is a massive, overwhelming presence of shadows, broken by little traces and rays of light, which do nothing but emphasise the lines of darkness. The noir lines. Love in some, death in all of them. That is why these flares of light bordering the frame are so important. The sense of menace – and danger – is always boldly underlined in the film. The light in Out of the Past – as Musuraca and Tourneur conceived it – serves not to illuminate and thus, in theoretical terms, give hope of (perhaps) reconstructing a life after the events depicted. The characters played by Mitchum, Kirk Douglas, Jane Greer, Richard Webb and Rhonda Fleming can only (maybe) live if they act smartly. But they are stupid. And that is the tragedy of Out of the Past. Consider Leonard Eels (Ken Niles). He looks like a dependable guy, right? Lean, elegant; he has a secretary who is more than just a secretary … But he is completely out of place in the film’s universe. He just does not fit there – so he will be killed. Just because he looks dumb. Tourneur always frames him from an unfavorable point-of-view. Mitchum, in his self-controlled, cool performance, always overshadows Niles – he is always at the right or closer to the camera, and he looks always from the top to the bottom (discarding the fact that he is crazily lying all the while). And pay attention to his clothes: tell me, does he not look like a carrot inside an oversized bag? Like David Byrne inside the Big Suit from Jonathan Demme’s Stop Making Sense (1984)? It may seem strange to call Jeff an idiot, since he is always finding ways to escape death. He calls the police to set an ambush on the road; he escapes Whit (Kirk Douglas) for much of the story; he has a taxi driver of his own. But his stupidity is not dispelled the moment The Kid (Dickie Moore) tells him that someone out of the past came to meet him. Because, just like in Sam Raimi’s The Evil Dead (1981), evil comes riding in to meet Bailey. He is doomed from the beginning. The glittering lights framing him are a metaphoric touch – like an embrace. Ann is his only getaway. But he runs away from her. And this scene – which is the first appearance of Jeff’s new love – is the diametrical opposite to the appearance of Jeff’s most important love, Kathie (Jane Greer). Jeff and Ann are close to one another, in love, well lit by Musaraca, and with the background omitted but sparkling at the sides of the frame; but when Kathie enters, she is ‘walking out of the sun’, with the whites exploding. I wonder how fast the lens was – and surely the set was very hot (recall John Alton’s essential book Painting with Light: sometimes they needed to add a great deal of backlighting and change the white props to light green, so as not to burn them). This opposition, allied with the characters’ personalities – this game of images and indemnities proposed by Tourneur – expands the layers and complexities of the universe in which Jeff Bailey lives, and from which he cannot escape. All things considered, Jeff Bailey should have noticed the lighting of his life. © Victor Bruno and LOLA August 2013.